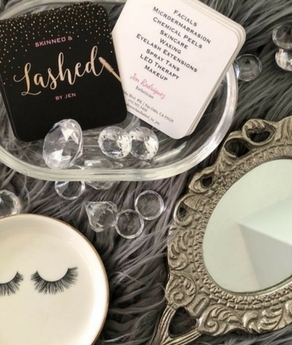 ﻿ Fair Oaks Lashes & Skincare | Skinned and Lashed by Jen. | Skincare Studio Fair Oaks Ca. Discover a beauty regiment that brings out your inner glow. We Moved, Come see us at our new location! Custom Skincare for Your Face. Lift your skin to a new level of health by targeting your own skin concerns. Image peels offer a variety of different peeling solutions for various skin conditions including acne, aging, sun damage, Rosacea or hyper pigmentation. These resurfacing treatments are designed to improve and enhance the skin. Benefits include skin clarity, even skin tones, uniform color and improved texture. Beautiful lashes extensions at any length or thickness. Who needs a reason to pamper and indulge? You don’t have to wait for your best friend’s wedding to enhance your look with fuller lashes. Whether you go for a natural look to enhance your already lovely looks, or do something a little more glamorous for fun. ‘Just because’ is reason enough. Loving your lashes is my top priority. I love making my clients feel effortlessly beautiful. together we will customize your lash length, shape and fulness based on your preference. Ongoing care and upkeep is available in two, three and four week terms. Our facial menu is comprised of customized skincare treatments for all. We offer men’s facials, purifying, moisturizing, illuminating and age defying options. It doesn’t have to be summer time to achieve that smooth sun kissed look we all love. We offer waxing for the arms, legs and face. Our specialty is in brow shaping. Around fair Oaks Jenn is known as the lash queen. Over the last several years she has mastered the craft of lash extensions. Schedule a free consultation today! Best lash stylist ever! Jenn takes her time and cares the health of your natural lashes while adding length and volume to a create beautiful look that's perfect for you! I had an incredible facial that I swear took years off my face. I highly recommend taking the time to treat yourself to this blissful service. Jen is amazing. I love my lash extensions and regular skincare routine with her.